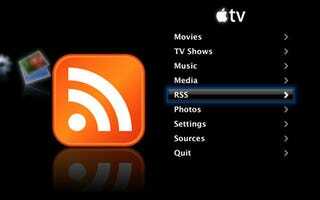 So now that Apple TV has gotten the mandatory Mario hack, the guys at twenty08 are giving Apple's slim box another feature, the ability to read basic RSS1.x/2.x feeds. Once downloaded, the plug-in gives Apple's box an extra channel, letting it display your favorite news headlines. ATOM feeds and video RSS support are coming soon. With all the new hacks, suddenly that $299 doesn't seem so bad after all.